James C. Ballard, MD, a surgeon with ROC Orthopedics, treats a full range of orthopedic problems and keeps current on the newest advances in orthopedic care including total joint replacement of the hip and knee. Dr. Ballard is committed to making your treatment as easy on you as possible. Rather than opting first for surgery, Dr. Ballard looks for ways to help patients with non-invasive treatments. Only after non-surgical methods have been exhausted does Dr. Ballard arrange surgical procedures for his patients. The ROC Orthopedics offices are located in Oregon City and Tualatin, just outside of Portland. Affiliated with Providence Willamette Falls Medical Center and Legacy Meridian Park Hospital, Dr. Ballard sees patients from communities ranging as far away as Tillamook and The Dalles. Regardless of the community, Dr. Ballard's patients consistently rate the ease of scheduling appointments, the quality of treatment, and Dr. Ballard's demeanor positively in communities around the web, with scores substantially higher than the national average. Dr. Ballard is a recognized expert in joint replacement and arthroscopy, with several appearances on local Portland media stations, including KPTV, KOIN, and KATU. Ballard's expertise has also been on display in several print magazines. Certified Physician Assistant Michael Garland helps Dr. Ballard treat patients for general orthopedics and joint reconstruction. If you have a question for Dr. Ballard’s office, please feel free to contact us. Dr. Ballard recently returned from a teaching trip in South Africa where he instructed surgeons on the new journey XR knee technology. He held teaching meetings in Johannesburg, Pretoria, Durban, and Cape Town. 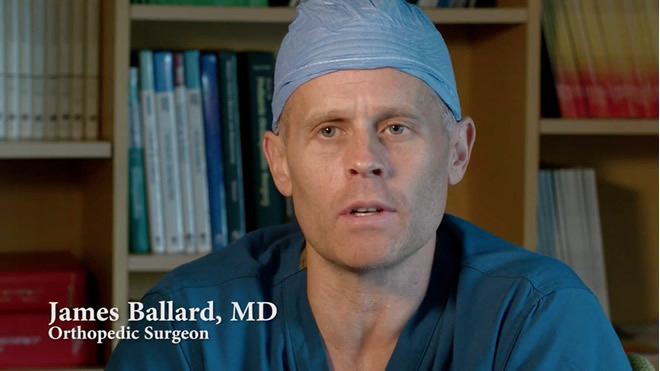 Dr. Ballard has been determined to be in the top 10% of Orthopedic Surgeons in his region. Dr. Ballard has been honored by his patients with a 2010, 2011, and 2012 Patients' Choice recognition, as well as one of America's Most Compassionate Doctors, tabulated by MDxMedical Inc.
Dr. Ballard is one of 8 local orthopedists voted to be “Portland’s Top Doctors”, by the local medical community and is featured in the January 2011 Portland Monthly Magazine. Portland Top Doctors were nominated by the collaborative efforts of Portland Monthly Magazine and Castle Connolly Medical Ltd, an independent medical research company. A total of 5, 501 licensed doctors in the tri-county and Southwestern Washington area were each invited to nominate up to 25 outstanding doctors in the region in 59 specialties. Nominee’s cannot vote for themselves and their medical license must be active and in good standing. Physicians cannot pay to be included in this list but simply, those with the most nominations were listed in each specialty.